The Howler Whistle produces such a clear, penetrating tone that ensures it will be heard. 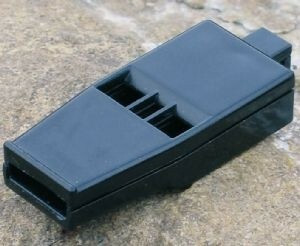 The plastic whistle uses no 'pea' but is very loud! Operationally invaluable in emergencies, rescue operations, outdoor pursuits and, naturally, sport. In use, too, at the Olympic Games. Signal orange and not even 10 g light.